Publisher: Cupples, Upham & Co. Many woodworkers carry with them a small notes book, in which they note down the rules for doing various types of jobs, and items to assist them in estimating. This book was begun that way: the author adding rules and other information from time to time, till he thought of having it published, with additions and illustrations, for the convenience of workmen. 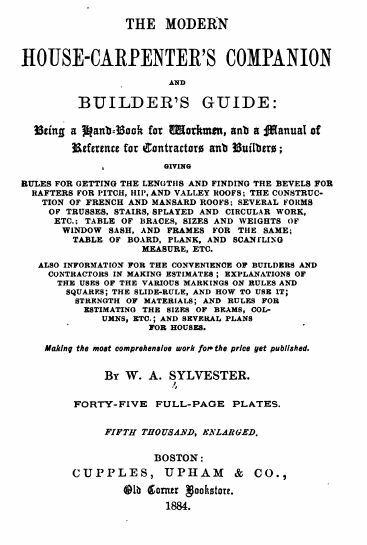 There are many large and valuable works on carpentry, but there are comparatively few carpenters who felt at the time to pay a lot of money for that type of info, so oftentimes when they could use a book like this, they went without.